Choose your story, order your pack and wait for the postman! Secret Agent Archie Bear works for “International Bear Security Services” and has a difficult puzzle to solve. You may be just the person he is looking for. Travel with him to a distant land and help him find the answer. 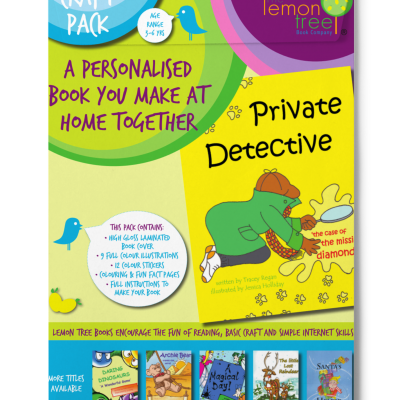 Each pack contains your book cover (you customise and download your own pages), colourful illustrations and stickers, fun fact and colouring pages as well as complete instructions to make your book. Secret agent Archie Bear works for ‘International Bear Security’ and has a difficult puzzle to solve. Travel with him to the island of Borneo to find one of the secret ingredients of a bear’s favourite breakfast. 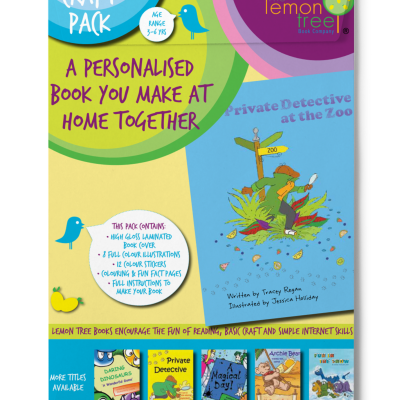 Each pack contains your book cover (you customise and download your own pages), colourful illustrations and stickers, fun fact and colouring pages as well as complete instructions to make your book. When somebody in town has a mystery to be solved, who is the first to be called? Private Detective of course! Examine the crime scene, find the clues and work out what has happened down at the zoo with all the missing fruit. 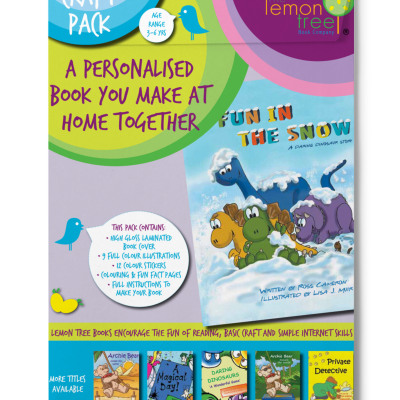 Each pack contains your book cover (you customise and download your own pages), colourful illustrations and stickers, fun fact and colouring pages as well as complete instructions to make your book. When someone in town has a mystery to be solved, who is the first to be called? Private Detective of course! Examine the crime scene, find the clues and work out what has happened to Mrs. Rottenly-Rich and her very expensive diamond ring. 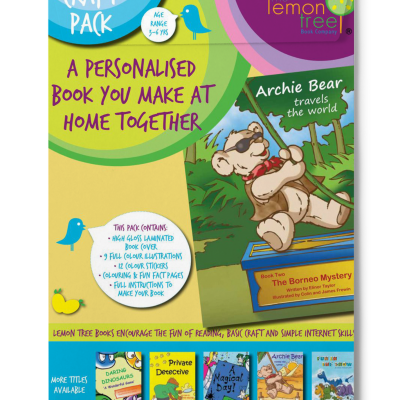 Each pack contains your book cover (you customise and download your own pages), colourful illustrations and stickers, fun fact and colouring pages as well as complete instructions to make your book. Come on a magical journey filled with fairies and fun. Follow Dimple and Pimple the garden fairies and explore the wonder of their world, in your very own back garden! 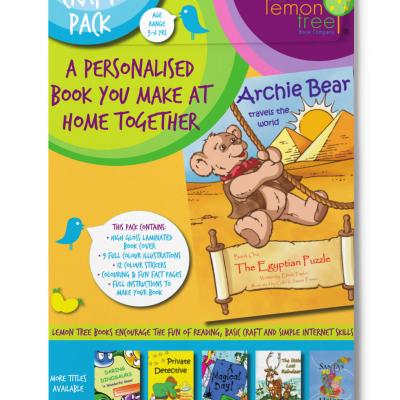 Each pack contains your book cover (you customise and download your own pages), colourful illustrations and stickers, fun fact and colouring pages as well as complete instructions to make your book. Imagine if dinosaurs were just like us, always looking for fun and inventing new games. What if you and your friends were dinosaurs having fun in the snow? What games would you invent? 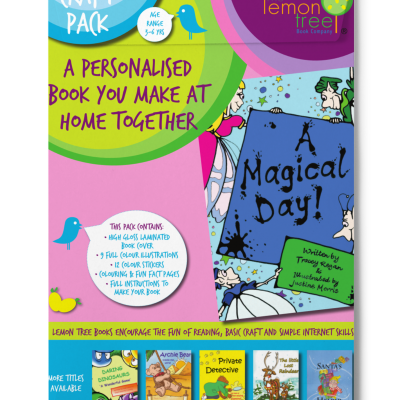 Each pack contains your book cover (you customise and download your own pages), colourful illustrations and stickers, fun fact and colouring pages as well as complete instructions to make your book.